The “tiny car” Japanese makers, Suzuki and Daihatsu, really focused on outdoorsy themes at the Tokyo Auto Salon this year. I feel like the production model of the new Suzuki Ignis wore it best. I’d definitely take it to Lake Haruna and make curry next to it. But I admit, I see it more as a spaceship than a camper. While the text here is clearly not something you’d want on your Ignis (probably? 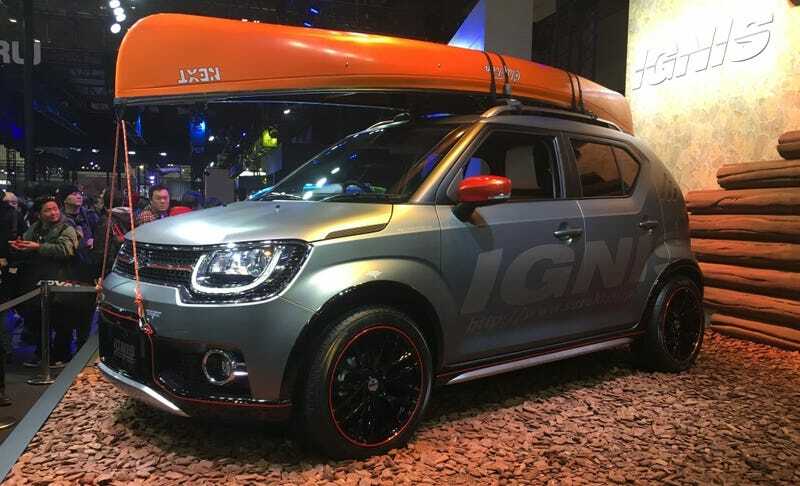 ), I pretty much like every other option I saw on the three Ignis models presented. The other two, in blue and orange, were really no different than the concept our very own Torchy covered in March. I chose to concentrate my attention on the outdoorsy model for a couple of reasons. First, I’m in love with its science-fiction look and feel. Starting with that gun metal matte paint. It’s not something that looks good on every vehicle, but it looks really good on the Ignis. With the WhizzKid C-Pillar vents and the cut corner shape, I think personal shuttle pod from Battlestar Galactica. The gun metal matte paint is exactly the right color for it. The running red-orange strips add to the look, with matching side mirrors, fog lights, headlights, and grill that all seem to work together to create something that very well looks like it could be Colonial technology. If Galactica was large enough to have its own cars like the SDF Macross ship does, I can see it turning out a lot like this version of the Ignis... Mind you, if I’m hustling over to repair some Raptors or Vipers, the last thing I’m going to need is a canoe! Second, I’m also very fond of the wheels on the outdoorsy concept. Not just because they have the matching strip along the rim edge, but also because the shape is so much nicer than the “snow boots” of the concept and typical production models. These things would look awesome on my GA3, and I’d consider getting them if the bolt pattern matched. The Suzuki Ignis is now available in Japan in the versions MG, MX and MZ. Each of those versions can then have either 2WD or AWD. All six combinations come with 1.2 litre four-banger K12c DualJet with VVT and hybrid technology. No manual, however, only a paddle shifter CVT. I guess nothing’s perfect, even canoe-bearing spaceships for the road.